The information presented on this web site is reviewed by engineers before publication. Where applicable, certain design data have been estimated based on similar data. While Engineers Edge technical staff does attempt to cross-reference data and investigate the validity of the data, Engineers Edge makes no warranty, either expressed or implied, as to the subject matter or accuracy of the information contained herein. Engineers Edge shall not be held liable for any type of damages resulting from the use of this information. 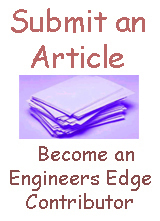 The user assumes all risk and liability in connection with the use of information in Engineers Edge. Engineers Edge design resources are intended for personal, non-commercial use. The contents, results, and technical data contained in this web site may not be reproduced either electronically, photographically, or substantively without permission from Engineers Edge. Once design data selection has been made, it is the user's responsibility to investigate and verify design conformance with the users particular needs.